Source of natural vitamin E. Plant sterols. Light flavour. No cholesterol. The most versatile oil in the kitchen. Contains 8000PPM oryzanol. Gluten free. Suitable for Vegetarians. 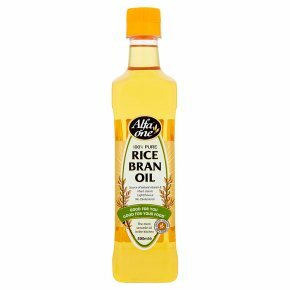 Make the healthier choice Alfa One Rice Bran Oil is naturally light and clean tasting. It is a source of natural Vitamin E, which contributes to the protection of cells from oxidatives stress. With a high smoke point (250°C), it is ideal for all types of cooking, including baking, grilling and deep frying. Light, healthy & versatile, Alfa One Rice Bran Oil is nutritionally well balanced and is rich in vitamin E. Its superb cooking qualities come from the high smoke point making it deal for frying, grilling, stir-fries and barbecues while also being perfect for salad dressings, marinades and baking. High in natural antioxidants such as Vitamin E and the Gamma Oryzanol, a naturally occurring plant sterol which has been shown to reduce cholesterol absorption. Alfa One Rice Bran oil is simply one of the healthiest and most versatile cooking oils, making it the perfect choice for any dish. Baking Alfa One Rice Bran Oil can be used in place of butter or margarine in most baking recipes. As a guide 40ml of oil in place of 50g butter, its also free of cholesterol and trans-fatty acids. Marinades Use Alfa Once Rice Bran Oil as a base for marinade. It will add tenderness to meats and chicken. Roasts Cook your favourite roast with Alfa Once Rice Bran Oil. Panfry, Chargrill & Barbecue Brush pans, chargrills and barbecue plates with Alfa One Rice Bran Oil before cooking. Stir-fries Alfa One Rice Bran Oil has such a high smoke point making it ideal for stir-fries Salads Mild in flavour and aroma Alfa One Rice Bran Oil is ideal in vinaigrettes, mayonnaise and aioli. This product may become cloudy at less than 8°C This is normal and will clear on gentle warming.